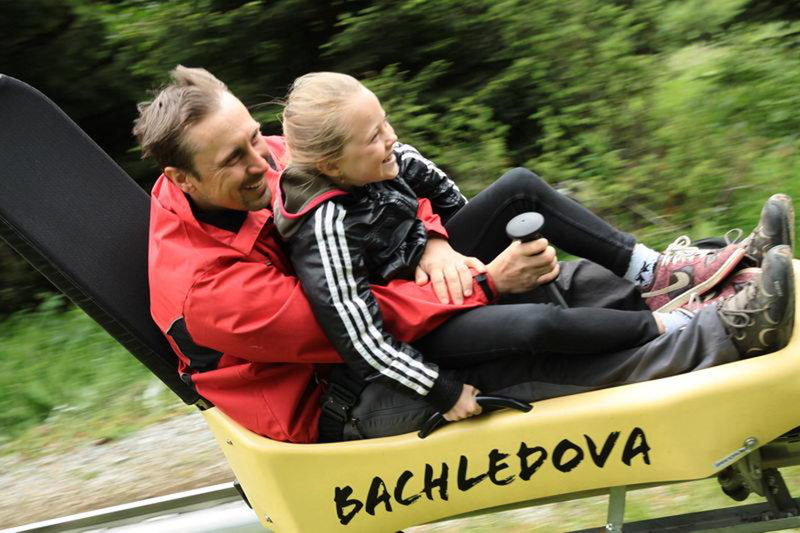 In Bachledová you can enjoy a ride on the longest bobsleigh track in the Tatras. It’s 1.200 meters long and has 15 turns which guarantees an unforgettable experience. Its vertical drop is 111 meters and the maximum speed reaches 40 km/ h. The track is open all year round. It is closed by the rainy weather only. Its transport capacity is 200 persons per hour. You can hop on the bobsleigh track at the upper cable car station. Price list. 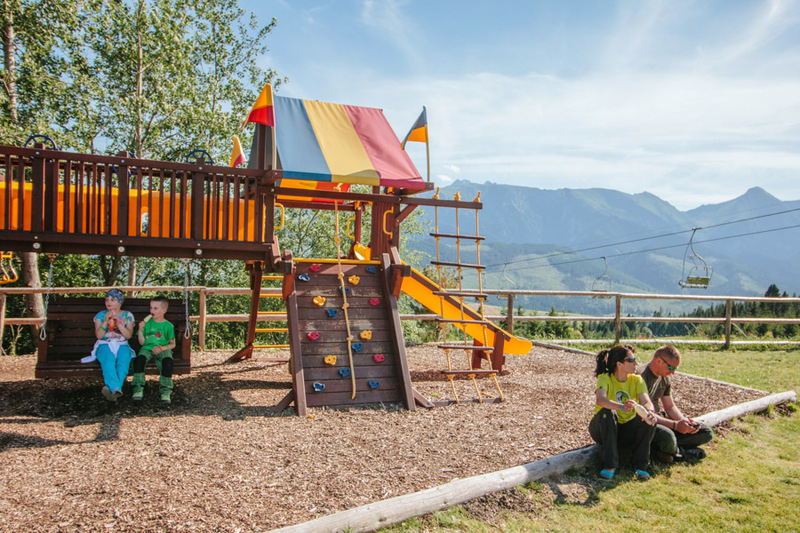 All playful and fidgety children can enjoy our big playground and have fun all year round. Tunnels, swings, slides, climbing frames and the castle – all that can be found on a new pitch in front of the buffet. 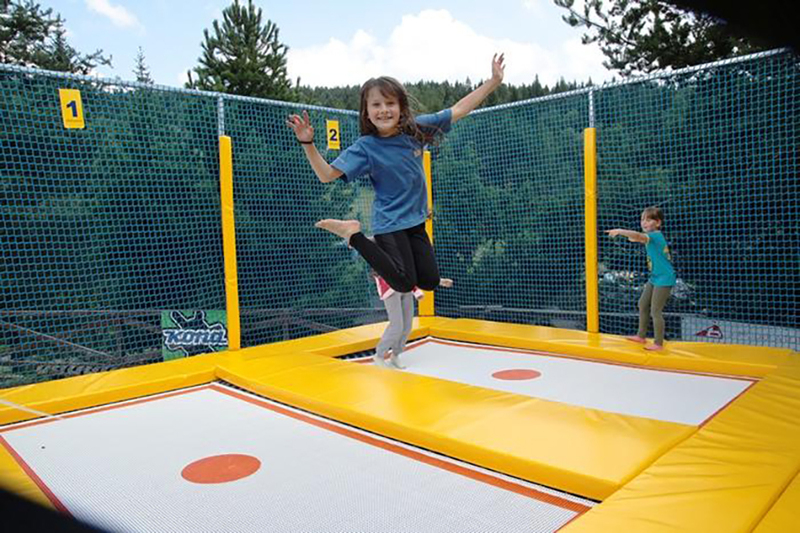 Children’s area features two professional trampolines which will attract not only children but also adults with lots of energy! 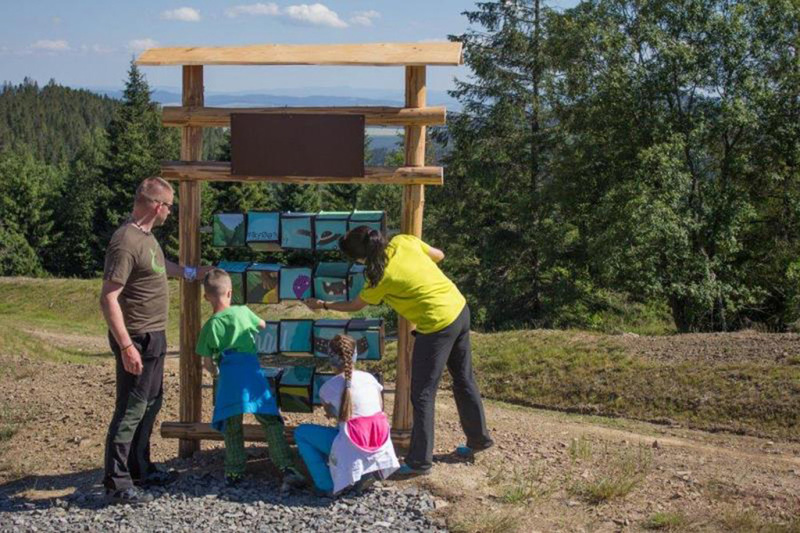 Bear Kubík forest trail has prepared some fun games for its little visitors like searching for the right food for animals, learning about leaves and cones, matching seeds with right plants or observing animal traces. 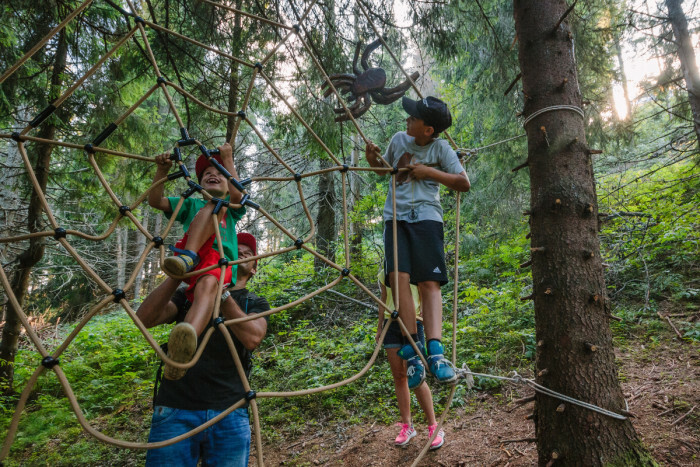 Come to play and learn new things about life in the forest to Bachledová. 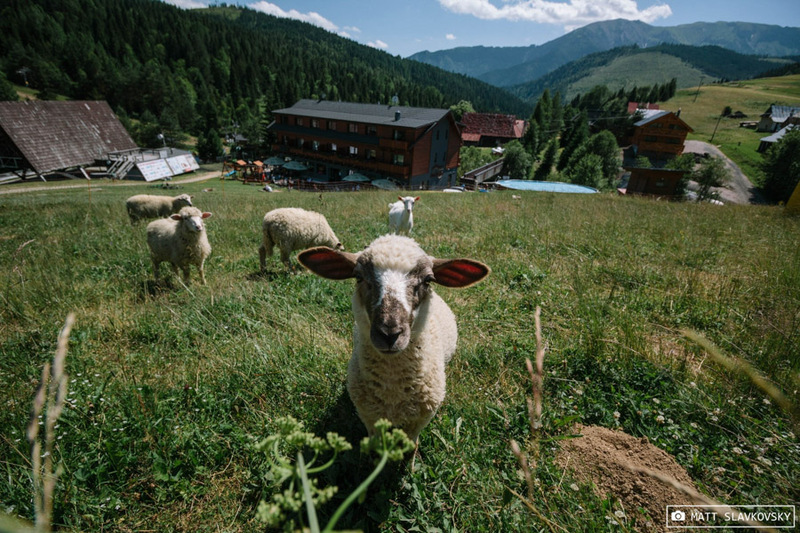 A small ZOO can be found within the area of the hotel Bachledka Strachan at the station of the cable car. Children can feed lovely rabbits, sheep and goats. Take a picture at out photo place and bring home a unique souvenir. Photo place is at Bachledka slope near the Treetop walk. A trip to Bachledka is not only fun but also an education experience. 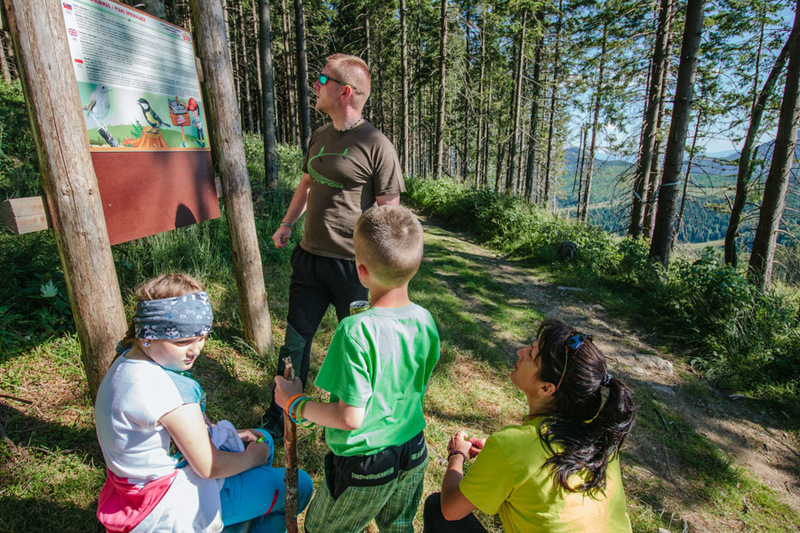 There is a children’s nature trail leading throughout the Magura ridge where the funny bear Kubik informs children about animals, birds and plants of our territory. The trail has two parts. During the walk around the small circle visitors get to know the animals living in the area. The trail has eight stops, is 300 m long and extends from the playground to the observation tower. At each station children can solve tasks and mark their results on the board available at the information center. If children solve the tasks correctly, they can enjoy a sweet reward. The big circle leads from the observation tower to the Jezersko lake. The trail is 6.5 km long and during the walk visitors get to know the birds living in the area. Nearby stations feature hummingbird feeders which give an excellent opportunity to observe the birds at close range. Visitors can test their flexibility, skills and strength on physical barriers and stations spaced along the pavement towards the lake. Searching for Gorgy’s elixir of life. Forest man Gorgy, mascot of Bachledka, lives in the forests of Belianske Tatry and Spiš Magura for several hundred years. He has eagle eyesight and solid health. His secret lies in the regular use of a special elixir of life produces by himself. How and from what? You have figure out by yourself. The mystery of the elixir is guarded by the inhabitants of the forest, and the indices of its declension can only be obtained from them. Take an adventurous journey through a miraculous forest, get to know its inhabitants, and unleash the mystery of Gorgy’s elixir of life.